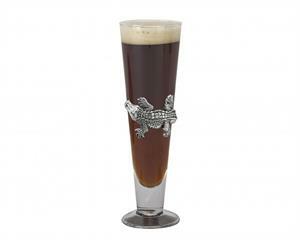 A sand-cast aluminum plate shines beautifully as it seemingly swims in the beer of Arthur Court's Alligator Pilsner. The glass opens wide as it builds toward the mouth of this easy-to-drink pilsner. Help any Gator fan celebrate with this 14 oz. glass. Size: Diameter 3.0" / Height: 9.25"